The 2012 Back To school: A true success for our kids! 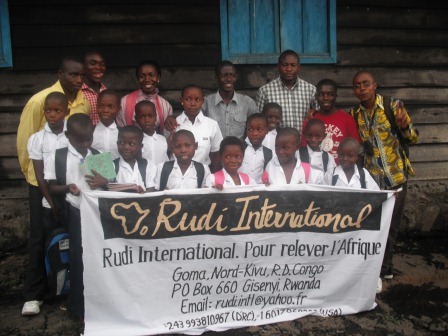 We are very happy to let you know that after our online campaign “Help Them Go To School”, all the 16 kids enrolled in our Rudi Education program have got sponsors and were able to go to school this Monday September 3rd with other students at their institution Eastern D. R. Congo. The Rudi International Team would like to thank you for believing in us and on behalf of the beneficiary, the kids, through their parents who were very happy to receive all the school items we could buy and give back to their kids, helping them to stay at school. Rudi Volunteers opening the “back-to-school” packages for distribution. – A new school uniform. In the D.R. 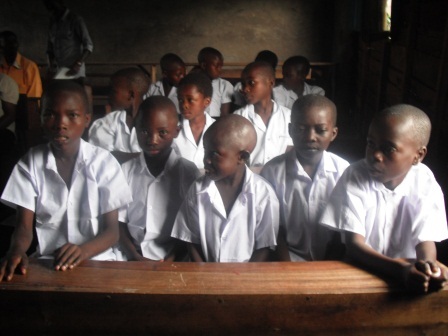 Congo, all the primary and high school students are required to wear a white shirt and a blue pair of shorts or skirt to be able allowed in class. – A blue and red pen, a pencil and an eraser, color pencils, a ruler. – A mathematical box which was given only to students from P4 as the others are not yet using the tools that it contains. – Toothbrush for girls only. This was a gift from a university student from Goma, a young lady who donated some items she already bought as her contributions to the kids. We appreciated it so much! The lady bought some items on her own and brought them to us so we could complete the package with whatever was lacking. Last Sunday in the afternoon, while it was raining, our staff could reach the place and found all the kids and their parents waiting. 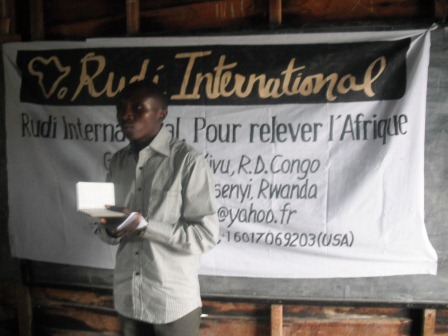 The previous day, we sent a message to our Rudi Education’s newest volunteers, Luc and Munguiko that we would be coming. Luc is one of the teachers and Munguiko is a university student and living near the school. 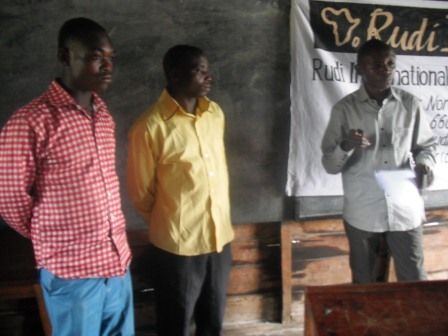 They accepted to volunteer in our Rudi Education program and help the kids in the way they can. 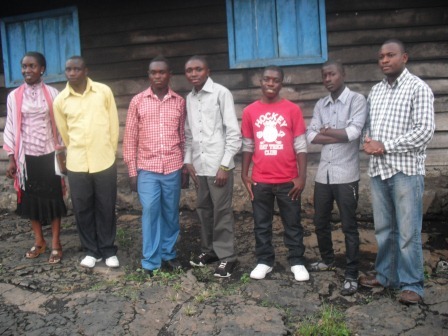 From left to right: Munguiko, Luc and Arsene Tungali while meeting the parents. 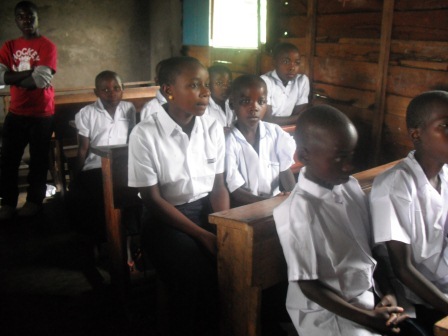 Once we reached the place, we entered one of the classrooms where they were all sitting. Without taking much time, Arsene Tungali had a word to the parents explaining what we were about to do, meanwhile, the rest of the team gave the clothes to the kids and immediately, they went to wear them in the next classroom. Later, they joined us, shining in their new white shirts and blue shorts/skirt. 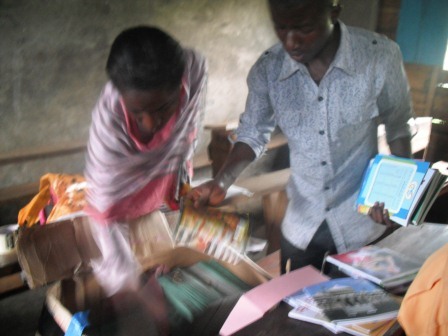 The next step was to call each one of the kid and give him/her the school bag with all the other items. After a photo of each kid, we called their parents and took another photo of the mother or father with his (her) son (or daughter). The parents were clapping making some wonderful cries after each one of the kids received his “gift”. After the ceremony that took place inside the classroom because it was raining outside, the rain stopped and we went out for the last family pictures. 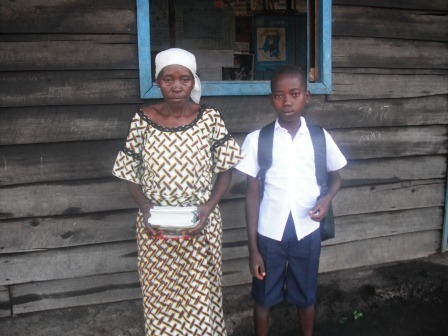 Another student with his mother. This is on the following morning because they were not there on the day of the distribution. “Muda wa kubarikiwa ukifika, hakuna anye weza kuzuiya sababu ni Mungu mwenyewe anaye bariki. Mungu aendeleye kubariki wale wanao kumbuka wasiyo jiweza”, which can be translated in, “when the time of blessing is there, nobody can stop it because God is the one who blesses. May He always bless those who care about those in need”. (Reminds me of Psalm 41:1-3). It was around 4.30pm when we decided to take our car and go back to town, a few kilometers from this rural neighborhood. The parents sent their thanks to all the donors and supporters. The kids promised they will work hard in order to have good marks at the end of the year so they can win another scholarship. … For that we can say “Lord willing!”. 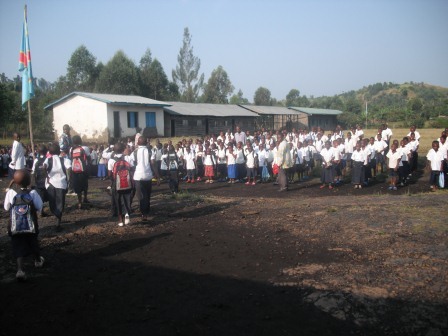 Monday, September 3rd at 7.00am, Arsene Tungali went back to the school and witnessed the back to school ceremony done by the school officials. 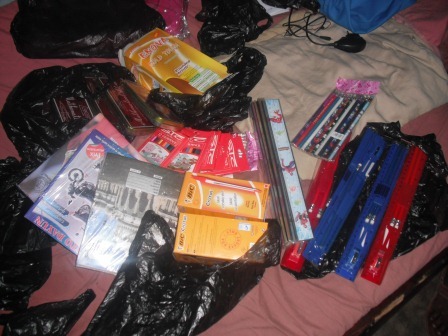 He also gave the packages to the 3 kids that were not present the previous day. They were not informed of our coming on Sunday. 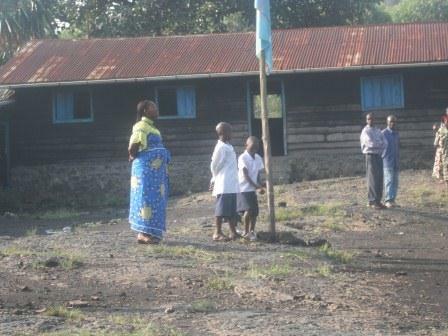 Raising the National flag while singing the Congolese national anthem, the new school director just behind those students. The Rudi International team of volunteers would like to thank you all for your donations of every kind that helped us launch the Rudi Education’s program and with you, we were able to help these kids affected by war to stay in school. At Rudi, we believe that this is just a beginning, these kids will have good influence and impact in their environment by the after school programs that we will be organizing with them. So, we STILL need you! 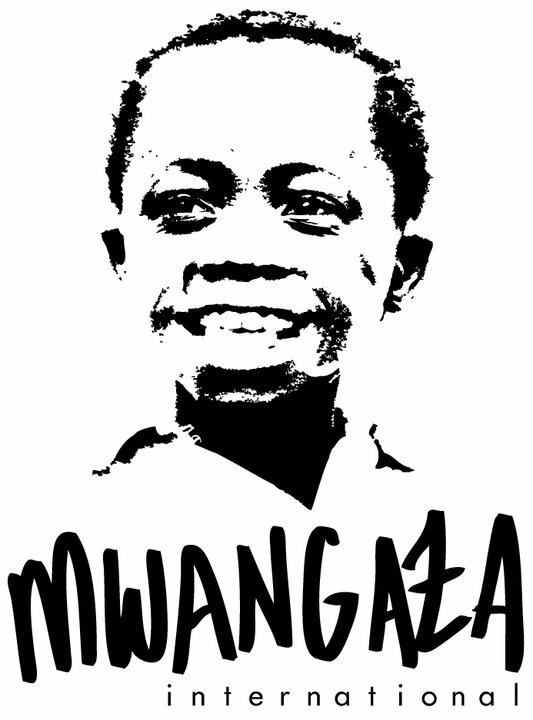 We want to thank Mwangaza International, our proud partner for being with us in the campaign and for helping us reach other sponsors. Their help was so precious and we are proud of them. In total we have 16 kids (8 girls and 8 boys) in our program that we will be following the whole year and post regular updates. Rudi for Women and Girls Online (Facebook). “We can give to people who will give us gifts in return. But we are more blessed when we choose to give to those who cannot pay us back” Joyce Meyers. Rudi International would like to associate you in this campaign. 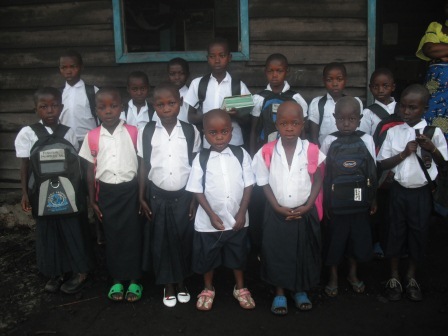 We want to support 16 kids in Lac Vert (Goma, DRCongo) helping them go back to school this year by September 3rd, 2012. Help us send them to school. – They have no one else and they count on you. – They are coming from the most war-torn region of the DRC, the Eastern Congo and have no hope for the future because most of their parents are doing artisanal farming. They said they need to go to school. 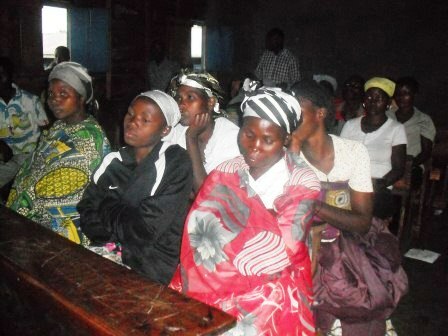 They are all in primary school and 15 of them are studying at Nyabyunyu Primary School in Lac Vert (10kms from Goma town) and one at Shabaa Primary School in Goma town. For a year, they need in total 80$ (eighty US dollars) giving them access to school fees, school furniture and tuition (after school program activities). 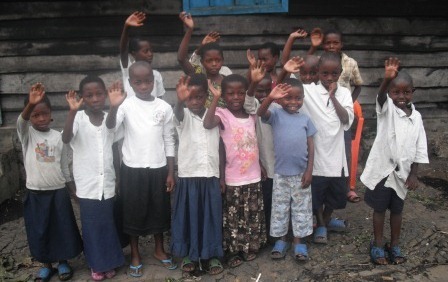 – Sponsor one or two kids of your choice by sending the total amount required and/or send the money monthly. – Share this message with your friends. 20 $ can buy a uniform allowing him/her have access to class, etc. DON’T HESITATE WHILE DONATING; EVERYTHING CAN MAKE A DIFFERENCE IN A KID’S LIFE. 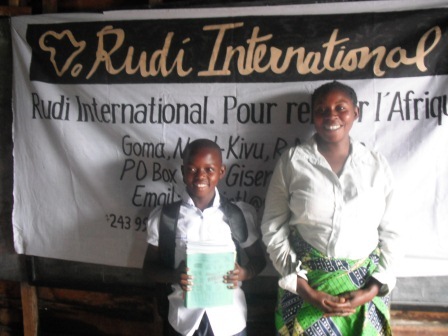 All the donations collected through the ways provided below will go to the kids in Goma for our Rudi Education Program. This last week end in Goma, DRcongo. 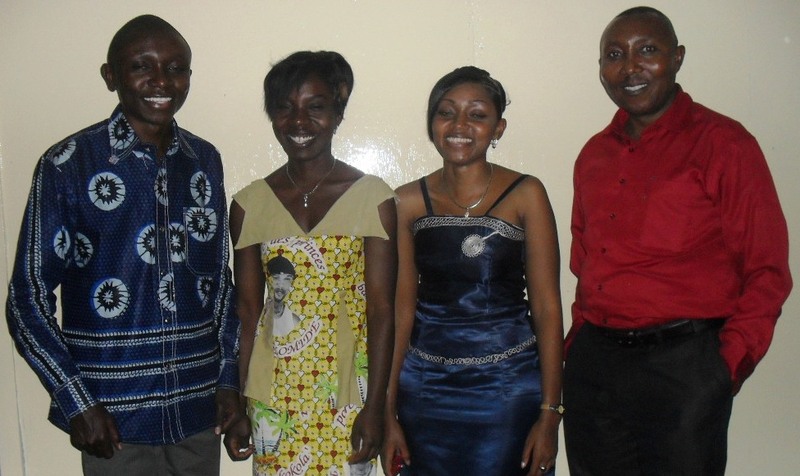 On this picture, from left to right, Arsene Tungali (Co-founder & Executive Director), Clarisse Leusa (Board Member, Goma), Elysee Sikitu (in charge of Finances and Administration) and Lebel Baguma (Board Member, Bukavu). This week end, we had the privilege to receive one of our Board Members, Lebel Baguma , coming from Bukavu (Southern Kivu, DRC) and visiting Goma (North Kivu, DRC). He got to meet with our local staff and other volunteers who are doing the amazing work on the ground. One of the most important things we discussed was our new Scholarship program that we plan to launch in few days. These people are doing an amazing work and we are proud of them! Rudi International. For Raising Africa! This post and its content have been moved to the dedicated Page for the Rudi Education program. 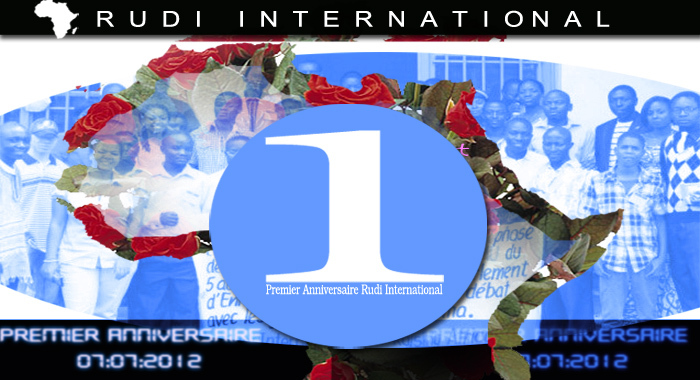 Le 7 juillet 2012 est une date importante pour nous car, en 2011, elle vit l’organisation Rudi International naitre suite à une vision partagée entre deux jeunes congolais, Arsène Tungali et Alain Rafiki, qui en sont les fondateurs. Ils ont partagé l’idée selon laquelle les fils et filles de l’Afrique devraient se mettre ensemble afin d’initier des actions concrètes pour son développement et son épanouissement. C’est ainsi que nous avons pris comme dénomination, Rudi International, « Rudi » qui est un mot swahili, se traduisant par « Reviens », un appel à la diaspora africaine de toujours penser à revenir au continent et participer à son développement. Ce samedi 7 juillet 2012, cela fait une année que l’idée est née. Une année de tâtonnement, une année avec beaucoup d’essai-erreur, mais aussi une année dont nous sommes particulièrement fiers car c’est le début d’une grande aventure caritative avec la vision d’atteindre toute l’Afrique, en commençant par la République Démocratique du Congo où l’idée est née. Dans la suite de ce blog, vous aurez le privilège d’apprendre sur les grandes activités que nous avons pu réaliser au cours de cette première année sur le terrain et de nos perspectives d’avenir. Voir la synthèse de nos activités au cours de cette année sur le blog de notre Directeur Exécutif, Arsène Tungali. Cela a été son discours lors de la cérémonie organisée a Cap Kivu Hotel a Goma pour célébrer ça. Merci a tous ceux qui ont contribuee pour le succes de cette ceremonie, mais beaucoup plus a ceux qui nous ont accompagne’ durant cette premiere annee de Rudi International. Nous sommes heureux de vous presenter ce blog ou vous aurez a recevoir de nos nouvelles regulierement. Nous vous souhaitons une bonne ballade dans les quelques pages deja disponibles sur le blog. Nous serons ravi de recevoir de vos nouvelles bientot!